Steam Coal | Pearson Coal Petrography - We fingerprint your coals, coke and carbons. 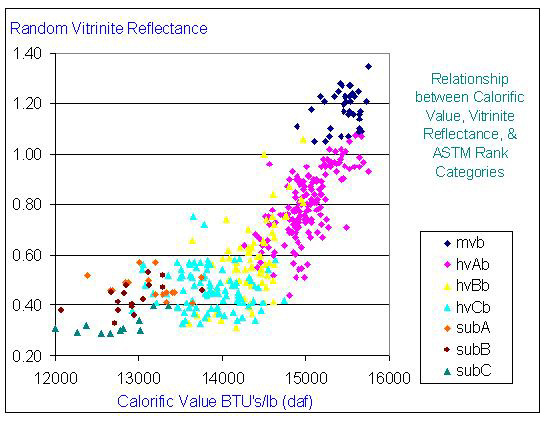 which is a compilation plot of about 470 individual coals, of wide geographic- and age-distribution from the United States, plotted in terms of their random Vitrinite reflectance, calorific value (in BTU’s/lb), and ASTM coal-rank category. (From Penn. State University coal database, courtesy of Gary Mitchell). Steam coals with different properties are often mixed together, leveraging the high reactivity of the lower coal ranks with the higher fuel ratio of the higher ranks, and what is delivered to the boiler is a blend. Figure 2 illustrates the two sets of participants in this blending route. 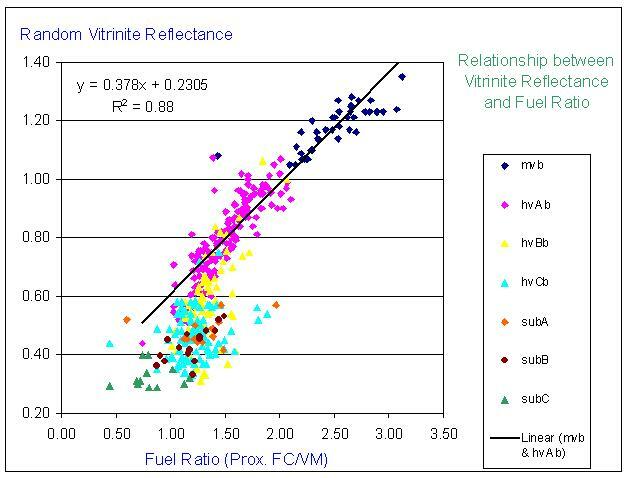 Coals with random reflectances below 0.60% have higher reactivities than would be expected from the linear regression of random Vitrinite reflectance versus Fuel Ratio shown for the higher ranks of coals. Our on-line brochure, Fingerprinting Coals & Blends, shows how automated Reflectance Profiling is used to characterize the inbound train- or barge-cargoes, and confirm the consistency of delivered fuel. 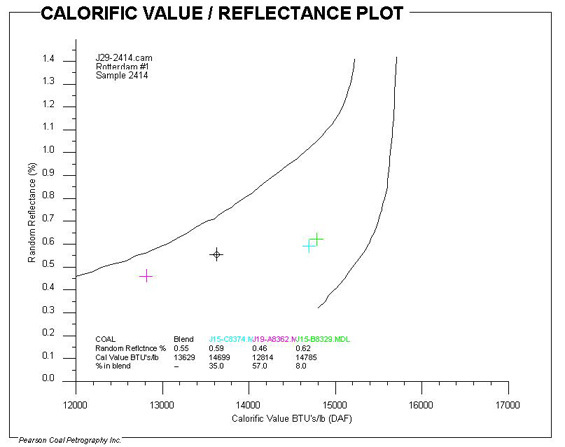 Fingerprinting is also used to determine blend proportions, from which the calorific value of the boiler-charge can be predicted, as shown in Figure 3. 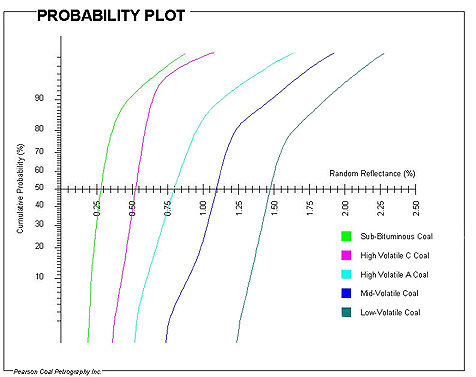 A simple estimate of coal reactivity and carbon burnout of coals can be made from the fuel ratio, but another, for the individual component coals in a blend, is given by the proportion of each coal with greater than 1.65% reflectance. This is determined from Probability plots, as shown in Figure 4. As noted by others, burnout among bituminous coals increases with rank.